Los Angeles-based swimwear designer Ashley Paige has designed a line of swimsuits for Target called Bikini Love. So far, there are 8 bikini styles to choose from at Target.com, some of which feature Paige's signature crochet style and seventies-inspired prints. Reader Janna, who tipped me off to this latest Target collaboration, saw the swimsuits in person and says they have a "St. Bart's inspired look." Sounds dreamy, although I can't say I'm in the market for a bikini at the moment. Do you have love for Bikini Love? A little while back, I outlined my Spring Essentials Checklist for 2009, and ever since, I've been busy tracking down each item, on a budget. Starting today, I'll be presenting my finds, beginning with the ever-essential denim jacket. 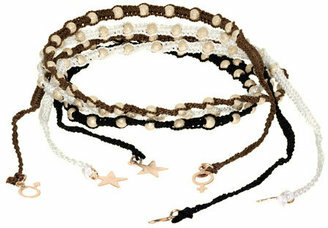 Wear one with white pants and a tee, a patterned skirt and tank, a tunic and black leggings, or over your favorite dress. Here are 11 of the most versatile yet on-trend jean jackets that I've found, priced from just $19.99 to $89.99. For details, just click any image in the widget below. Enjoy! 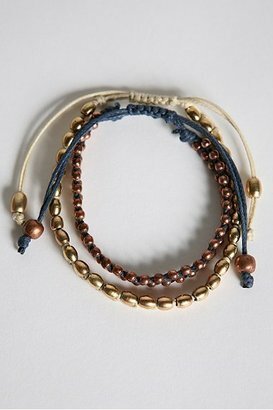 ...or you could test the waters with these beaded bracelets from Urban Outfitters, which cost just $24 for two strands. I love this look and I'm wondering if I could make these on my own for even less. DIY, baby. ...Loving the belt, but not loving the price? Try this belt from Forever 21 instead. Available for just $8.80 in either brown or tan, Forever 21's version has the same raised buckle and pyramid studding that makes the original so unique, at a fraction of the price.